Qualified sparkie Ryan Sutton plans to electrify the NRL when he takes up a new life in Canberra next year. But that’s only made him doubly determined to go out on a high this weekend when he plays his final game for Wigan against Warrington. “We’re never going to have this group of players here again,” acknowledged Sutton who – along with Sam Tomkins, John Bateman and coach Shaun Wane – aims to bow out in style at the Theatre of Dreams. “To get into the position we have, with all the emotion surrounding it, with so many players leaving, is credit to the coaching staff and the players. “It’s great to get to the Grand Final, but you’ve got to go and win it now. As a proud Wiganer, Sutton admits the move Down Under – away from his family and friends – will be a wrench. But it’s a challenge he says he couldn’t turn down. “It was a big decision for me to decide to go to Australia,” he acknowledged. “It took me a long time to make up my mind, going back and forth, but in the end the opportunity was too big for me to turn it down. “It’s a very similar place to Wigan to be honest, and that’s what attracted me to them. “There were other options, but hopefully that will make the transition an easier one to make. “And as soon as I made the decision to go to Australia, I wanted to go out with a win at Old Trafford – 100 per cent. 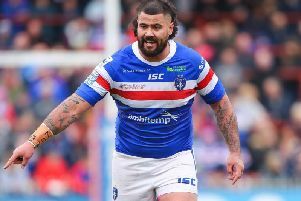 Sutton will at least have a few faces to greet him in Canberra – former Super League Josh Hodgson, Elliott Whitehead and, of course, Warriors team-mate Bateman. “That was another factor in me going there, the number of English lads there,” he revealed. “That can only help me settle in, and I’m very much looking forward to it. “If I didn’t think I could do it, I wouldn’t be going there. Sutton is also determined to give outgoing coach Wane one last performance – to thank him for his career in the game. “I can’t speak highly enough of Waney, he gave me my big chance,” Sutton added. “Without him I don’t think I’d even be playing rugby league, in Super League. “I had a job, I was a sparkie, an electrician, and was wondering if I’d ever be good enough to make the grade. “I was playing in the Academy, as well as for Ince Rose Bridge, but my mum and dad insisted I took on a trade. “I was working for my uncle, who’s a good friend of Waney, and probably just as hard with me as he’s been! “But that’s probably helped me with my rugby and making the grade. “I got all my qualifications, and it’s nice to have to fall back on away from the game. “It’s not like we’re footballers who are earning hundreds of thousands of pounds a week, and we’re retired at 35.